NOTE: The low level laser therapy (LLLT), especially their therapeutic effects, is on scientific discussion and will not be generally medically recognized. It belongs to complementary therapeutic methods. The new infrared laser of schwa-medico´s proven Modulas laser family meets the challenges of the digital age and the associated requirements of the users of technology and appearance. The MODULAS TOUCH combines technological expertise with an appealing and timeless design that will fascinate you. No useless or awkward mechanical switch operating units disrupt usability and appearance. His clear and attractive line will persuade you from the first sight and makes you curiously on more. 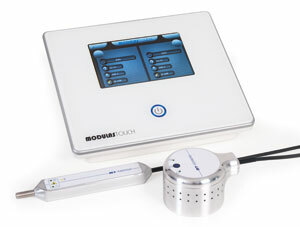 The functionality of the MODULAS TOUCH associated with the intuitive controls on touch screen technology. It will support and enrich your daily practice in various application areas, such as in the treatment of pain therapy or trigger points and acupuncture treatments. The laser device for pain therapy with pre-installed ( expandable ) therapy library and the possibility of individually free adjustable frequencies from 1-99999 Hz. In the version for the auriculo therapist additional with the integrated frequencies of Prof. Bahr, Dr. Nogier and Dr. Reininger to the diagnostic and therapy of interfering fields. In both versions you also have the option to create your own favorites - for example to start diagnostic or therapeutic procedure faster, especially for frequently recurring treatments. The laser devices are delivered with a hand probe ( e.g. for trigger and acupuncture points ) and a capacity of max. 150 mW as well as with the ergonomically designed area laser probe (e.g. treatments for arthritis of the knee and elbow or back pain treatment ) with 16 integrated diodes and a total capacity of max. delivered 960 mW and allow the simultaneous operation of both probes. We look forward to presenting you the MODULAS TOUCH and hope that he will be an essential therapeutic agent in the treatment of your patients for you.